I learned long ago that my life was not complete without coffee. I proudly bring a whopping litre of coffee with me to work in the morning in two thermal mugs because that earthy, spicy black liquid makes me smile with every sip. My time working in a coffee shop had very little to do with this adoration, however it did help me understand what I can do to make coffee taste even better. Over the years, and in a variety of homes and apartments, I have tried (to varying degrees of success) to create the perfect Coffee Bar: a place where I can make delicious coffee for myself and my guests and do so stylishly. 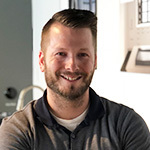 Braden works at the Ensuite Bath and Kitchen Showroom in London, Ontario. What exactly is a Coffee Bar? Boiled down to the basics, it is usually a small area, not attached to the main counter of a kitchen, where there is some form of coffee creating contraption and sometimes a bar sink depending on how much space and change you can muster in the area. 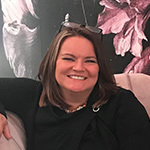 They can be in the kitchen itself, in a den, living room, dining room; virtually anywhere - except maybe the bathroom, and only in the bedroom if you have a wet bar and/or are as in love with coffee as me. Depending on what kind of permanency and plumbing you are working with, you can add a faucet and/or a sink to make the Coffee Bar that much more functional. For me, running water is the very minimum of a great, permanent Coffee Bar. A few of my apartments had bar carts without running water, and while they did the job of storing my plethora of coffee paraphernalia, I was not very fond of running to the kitchen sink to get more water, and rinse mugs. Water also is one of the biggest factors in making coffee taste at home like it does from a store. Most commercial coffee shops will only use filtered water to make coffee, and it is always the first thing I recommend to people who say that the coffee they make at home never tastes like it does when they buy it elsewhere. Some stores will even go so far as to use an RO system, however this is not always required. 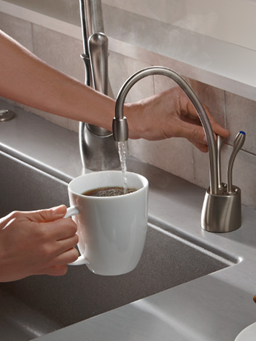 If you are adding a Coffee Bar to your home, and plumbing it in, but do not have a water filter system already, you can add a system such as those from Insinkerator. These lovely creations will filter your water, creating better tasting coffee, and have instant-hot systems that will pour out water at near boiling temperatures, making them perfect for coffee presses. TIP! You should never use boiling water (100C) for coffee, as it will burn the grinds, instead you want to aim for as near as possible to 96C, but not any higher. An instant hot/filtered water system necessitates a sink. You likely won’t have room for a full sink, and getting the most out of your space is key. Realistically, you will need this sink to rinse cups, clean coffee maker parts, and fill reservoirs, so it does not need to be too large. If you do go for larger (no more than 20”) try to make sure it is a sink that adds layers of functionality, like the Kohler Prolific sink line. 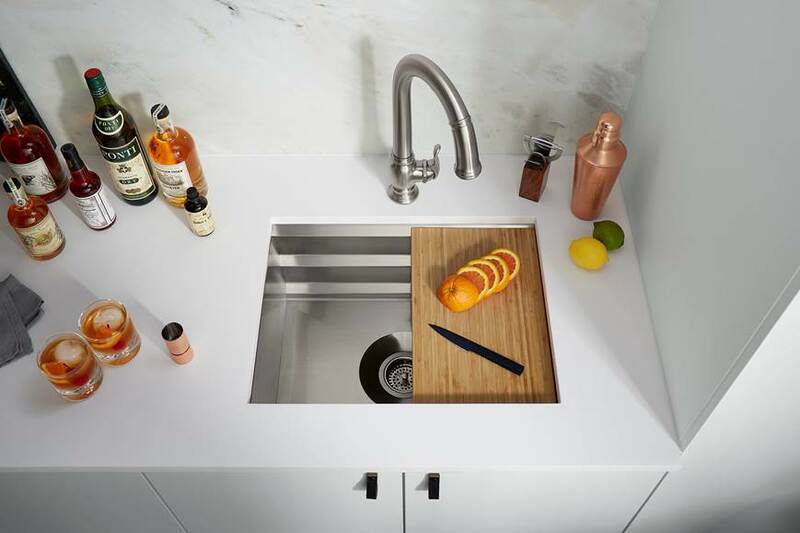 These include ridges in the sink that can have a variety of accessories mounted at one of three heights, making it perfect for rinsing & drying dishes, or soaking smaller parts. If you go for a smaller sink, make sure it is one that has sink grids so that everything can drain properly. While smaller, bar sized sinks may not require more than an instant hot/filtered water faucet, you may also want a traditional faucet with or without pull-down capabilities to aide in cleaning, or for when more water is required. 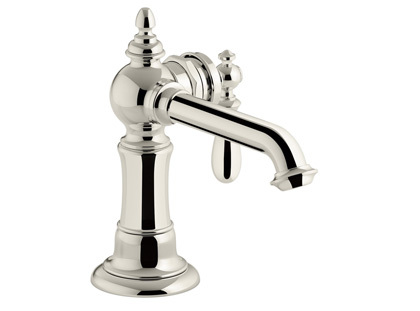 It is important to note the difference between beverage or entertainment faucets, and bar or prep faucets: while terminology varies amongst manufacturers, usually a beverage or entertainment faucet is intended to only have cold, filtered water run through it, while a bar or prep faucet is essentially a miniaturized kitchen faucet. 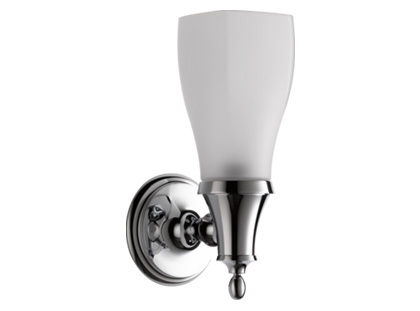 My favourite bar faucets have pull-downs and multiple spray options, like the Brizo Solna because I want to make sure everything is clean, without taking it to the kitchen. Bonus marks for touch faucets, because once you start using one, you will tap every kitchen faucet trying to turn them on (sometimes to the amusement of your family). What about Coffee Bars where you cannot have a sink? Or perhaps you do not want one? What do you do then? Pot fillers come in handy here. You only need a cold-water line to the area, and it is perfect for a variety of applications. If you have a coffee maker that has a reservoir, install the pot filler so that it can reach without having to adjust the coffee maker. If you use something like a coffee press, you can either add an electric kettle or a hot plate to warm the water. If you’re like me and love the taste of coffee from a Syphon, get an electric one and all you need to do it add water from the pot filler in the morning to get the delicious brew going. Ultimately, your dream Coffee Bar needs to be designed with your personal luxury in mind. Mine is bigger than the kitchen countertops were in my first apartment, because I have an espresso maker, coffee syphon, coffee grinder, and French press that I want to arrange nicely and within view. I also want to be able to rinse my coffee contraptions nearly immediately after use, so a sink with either grids or some form of layers is mandatory. I also don’t like to wait more than a few minutes for coffee, so having near-boiling (but not boiling water) on demand is a must. Other than that, it can be as basic as it needs to be, and doesn’t even have to be the only focus of the space - put bookshelves above the coffee maker, or integrate a bar - the possibilities are quite literally, almost endless. 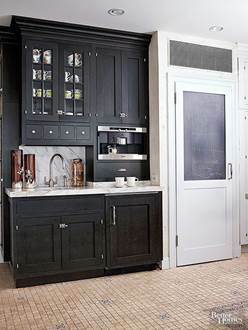 Added points: Lots of coffee bars will utilize a warm feeling, utilizing natural wood tones, or metal. Why not add iron pipe shelves with live edge wood shelves? You can get everything you need from The Ensuite Bath and Kitchen Showroom near you to make the perfect Coffee Bar! 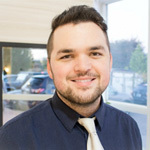 We love what the experts have to say about working with small bathrooms! Check out Genevieve Gorder on how to make the perfect space in a small bathroom. There’s something about this particular faucet that caught my attention ever since I first stepped foot into the showroom. 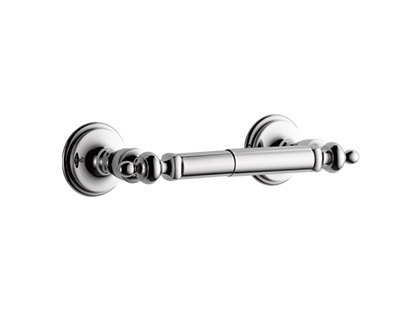 The sleek lines and contoured edges that blend into the prominent lever handles and spout, resembling the tail fins of a 1950’s era Cadillac show off a modern take on a classic look like no other. I’ve always loved anything that resmbles the “atomic age” of Americana. Whether it was simply the post-war optimism of the nation, or the ever growing fascination with the space program and aeronautics. This faucet looks like it was designed to be aerodynamic and fast. 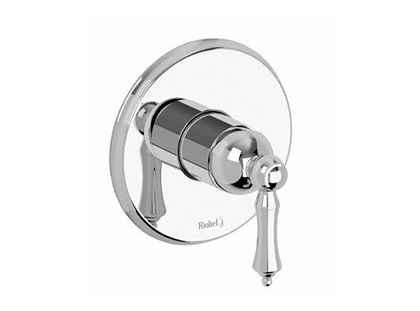 With a variety of different finishes by Brizo ranging from chrome, polished nickel, and matte black (to name a few), this faucet is sure to grab the attention of anyone who sees it. Make the bathroom complete with matching tub fillers and shower trim for a modern classic look you’ll be sure to fall in love with! Find out more about Brizo Sotria! House & Homes Lynda Reeves gives us a first look at her newly renovated bathroom! 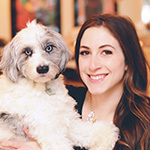 Check out what she has to say about her bathroom and what inspired her.